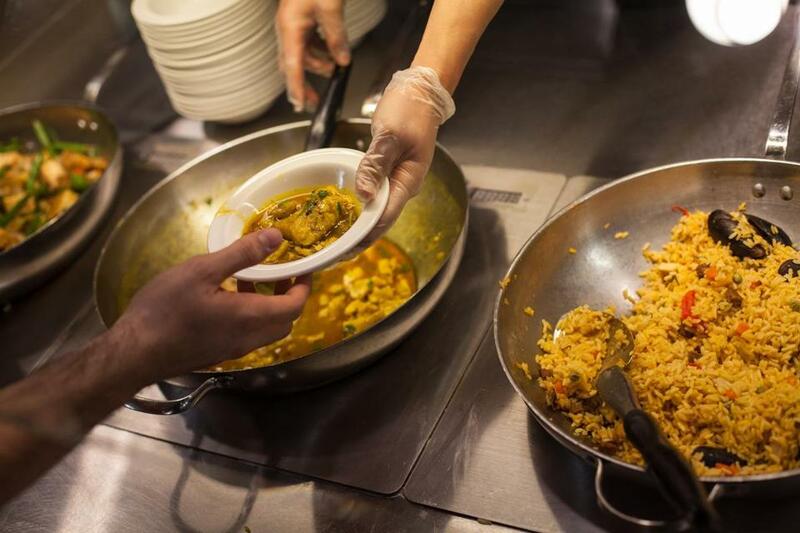 Fish curry, made with locally sourced redfish, is served at a UMass Amherst dining hall. AMHERST — At UMass Amherst’s Hampshire Dining Commons, one of many places to eat on campus, there is always a selection of seafood dishes for students to choose from. Recently, at lunchtime, Ronan Maza, a junior from New York City, opts for a plate of Ecuadoran-style redfish, or encebollado, a traditional fish stew with yuca, tomatoes, cilantro, and pickled onions. “It matters what fish I’m eating,” says Maza. “I prefer sustainably fished.” Information cards indicate that the redfish is responsibly harvested from the Gulf of Maine. Elsewhere in the circular dining room, Josiah Boirard stands in line for a fried local hake wrap. The freshman from North Attleborough likes seafood because it’s a healthful protein. “My parents are from the Caribbean, so I’m familiar with all kinds of fish,” he says. The students’ other options that day are redfish curry, mussels steamed in saffron broth, seafood and sausage paella, and Atlantic pollock with avocado, corn, and tomato salsa. Last fall, with GMRI’s help, UMass Amherst executive director of auxiliary enterprises Ken Toong and his management team started buying more local seafood. “It’s the right thing to do to support the local community and jobs,” says Toong. Students are on board, if not nudging the administration along, as surveys reveal that they’re interested in a diverse selection of tasty, healthful, local, and sustainable foods. “Students are demanding more responsibility in our sourcing,” says Garett DiStefano, director of residential dining. These are, after all, the millennials (approximately 16 to 34 years old), who recently surpassed baby boomers as the country’s largest generation. There are plentiful fish in our waters, specifically in the Gulf of Maine, which stretches from Nova Scotia down to Cape Cod. Five underutilized species — Acadian redfish, Atlantic pollock, dogfish, whiting, and Atlantic mackerel — have been targeted for full-court press. Each is abundant and harvested well below sustainable quotas due to lack of demand. That’s where the college students come in. Unlike old-time New Englanders who can’t seem to shake their stubborn appetite for staples like cod and haddock, millennials appear willing to try lesser-known species. Of the five, dogfish may be the toughest sell. Atlantic spiny dogfish, a small shark, is unfortunately named — according to the FDA it must be called either dogfish or cape shark — and has a meatier texture than familiar flaky white fishes. Sourcing dogfish can be difficult, says Wellesley College executive chef Keith Tyger, but the reviews are good when he uses it in dishes like chipotle-flavored, tortilla-crusted baked dogfish. “So much comes down to preparation,” he says. At two Maine schools, University of New England, in Biddeford and Portland, and Colby College in Waterville, students are eating a new product called “shark bites”: large chunks of dogfish prepared with a gluten-free coating, baked, and served for fish and chips or in tacos. Seafood distributor Ipswich Shellfish Group worked with Framingham’s Elevation Brands to produce the item. 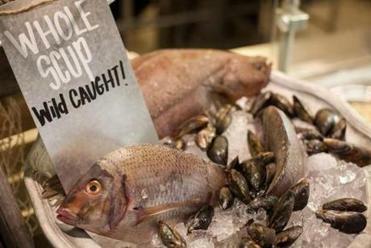 “We were looking to bring a product to market that supports local fishermen,” says Dana Bartholomew, sales and marketing director for the Ipswich company. Of the approximate 22 million pounds of dogfish landed on the East Coast, most is exported to Europe, much of it destined for Britain’s classic fish and chips. Dan Roy, UNE’s area general manager for Sodexo, the company that manages the food service program for both UNE and Colby, says students have enjoyed various preparations of local seafood, including fajitas-style hake, lemon-dill redfish, and shark bites tacos. “They’re not looking for cod or haddock,” he says. UMass peers who gobble up seafood at a rate of 21 pounds per year versus the average American consumption of 14 pounds. At Harvard, students are interested in local and healthful foods and ask lots of questions, says Crista Martin, director for strategic initiatives and communications for dining services. When it comes to the seafood dishes served, she says, “They’re focused far more on the preparation than the fish.” That may be a key message when catering to food-savvy millennials: It has to taste good, and if it does, they’ll eat it. UMass Amherst chef de cuisine Bob Bankert agrees. “It’s an easy sell when it’s visually appealing and tastes great.” Students like his cashew-crusted baked pollock with jicama mango slaw and lightly fried pollock with sweet chile glaze. Next semester he plans to introduce Atlantic mackerel, a stronger-tasting fish (similar to bluefish), prepared with robust Korean flavors. “Whiting is a tougher application for us,” he says, because it’s a small, lean fish with delicate fillets that can overcook quickly. Students are the future seafood consumers in restaurants and markets, says UMass Amherst’s Toong. He believes that the ground-up approach of exposing them to local seafood will make them more adventurous buyers down the road. Now all they have to do is learn how to cook.